What kind of crankset is this? Can someone help me identify this crankset type? And is it possible to replace only the cranks (and their axle) without replacing the chainwheel/front derailleur? This is a cottered crank. 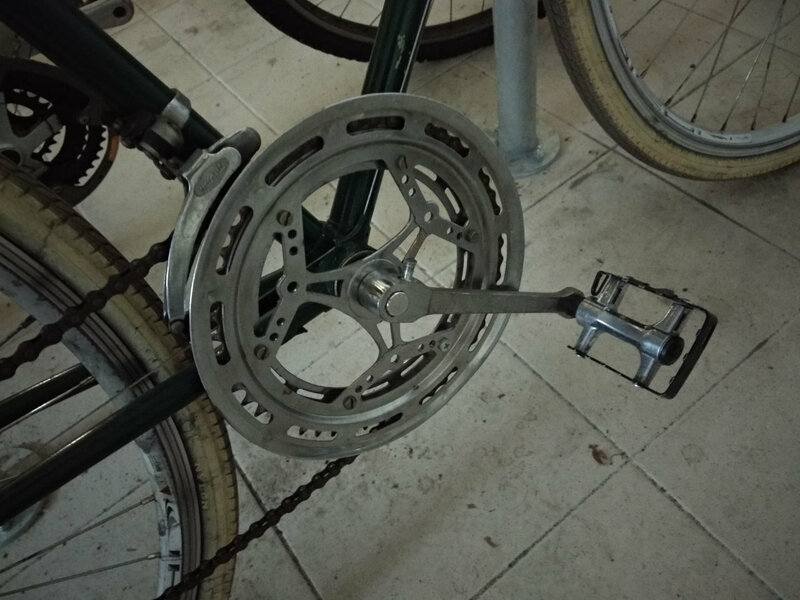 The chainrings are fixed to the crank and can not be moved to another, but you can replace the entire bottom bracket (combination of axle and bearings) and crankset. There should be no need to replace the front derailleur. 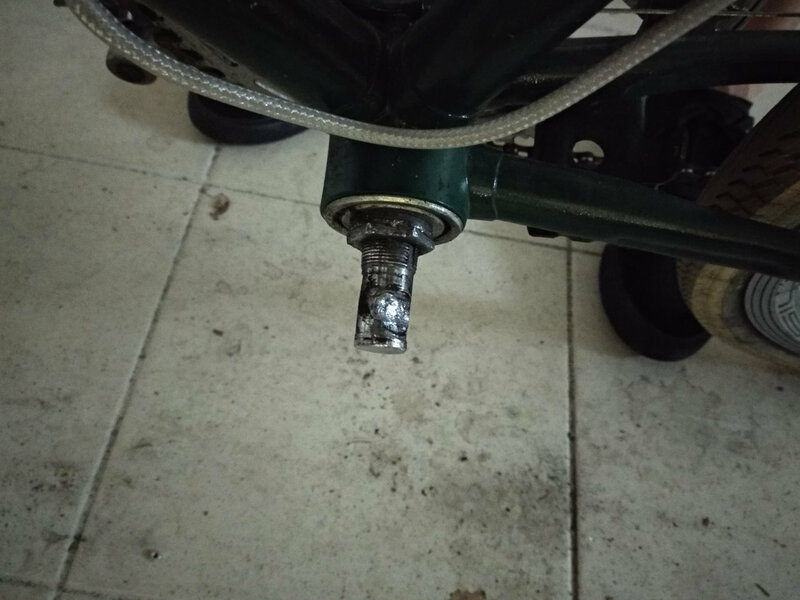 There is a risk that the bottom bracket shell is threade for an obsolete standard. To make any guesses if that is the case, we'd need to know the brand of the bike and width of the bottom bracket shell part of frame without any parts that are screwed in. To add to ojs's answer. You can replace the bottom bracket and crank with a inexpensive set. You just need to match the chainring tooth-counts. The cheaper cranksets use a square taper axle. The only problem you will encounter is selecting the correct axle length to laterally position the chainrings properly. To do this you will want to know the chain-line measurement. This is the distance from the centerline of the frame to the center of the mid-point between the two chainrings. Looking at that bottom bracket, hopefully it uses some type of freewheel removal tool to remove the cups. If not good luck finding the tool. Honestly on a bike like this, I'd just replace the bike. If you indeed want to fix it, first step is removing that bb. Seconds, get a bb, and a crankset with similar sized chainrings. Bb spindle length should be matched to crankset you buy. Chainline will be off 2mm but it won't be an issue. As your bike is probably 126mm rear axle spaced and more modern bikes are 130mm. Third try to make it shift. Replace front derailleur or chain if needed. This is a bit of challenge. That chainring design looks familiar, may be an old Nevar or Stronglight. This appears to be French and cottered. If I remember correctly, several sizes of cotters, English, French, and something else. French are narrow and longer pins The bottom bracket, cups, bearings and races are most likely French spec. Very difficult to find, so try to find in it either France or UK. Good luck. What has not been said yet is that seeing the threads on the spindle (axle) I'm 99.9% sure that it is a cottered bottom bracket with threadless shell. Unless this frame has substantial emotional value, replacing the bottom bracket is not worth economically. Nevertheless, there are square-taper sets with sealed bearings and threadless nylon cups available in Europe for about €15. I've fitted one myself (with huge success until now) on my Russian-made Ural bike and it's holding amazingly well. The idea for me was to benefit from square-taper (in my experience less maintenance and more reliability than cotters). Not the answer you're looking for? Browse other questions tagged crankset or ask your own question. Replacing Crankset. Do I need to replace chain? Then do I need to replace cassette? What kind of crankset to get for this bike?